Last week, a number of popular apps went free in celebration of the App Store's fifth anniversary, with Infinity Blade II among them. According to publicist Laura Mustard, who spoke to AllThingsD, Chair's hit action RPG scored 5.7 million new players during the seven day promotion. That amounts to three times the normal number of downloads that the game earns in a week, which could earn Chair quite a bit of revenue in the form of in-app purchases. Infinity Blade II offers players bags of gold to speed up item acquisition and gameplay. Like many other games (most of them free-to-play), the normally $6.99 Infinity Blade 2′s revenue is bolstered by in-app purchases of virtual gold currency. With a couple million players who got in the door for free, it doesn't take an economist to wonder if they might be in a gold-buying mood. However, Mustard downplayed the importance of in-app purchases for the game. "While we normally notice an increase at times when we’ve done free promotions, we don’t think it's significant, because the game is balanced in a way that does not require any IAP," she wrote in an email. Chair's original Infinity Blade game, priced at $2.99 during the App Store sale, also saw 2.5 times as many downloads as the week before and a related e-book, Infinity Blade: Awakening had a 70% increase in sales. 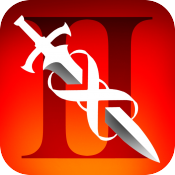 Despite the success of the Infinity Blade series, Chair co-founder Donald Muster revealed last week that Infinity Blade Dungeons, a dungeon crawler that made its debut at an Apple event in March 2012, had been permanently shelved. He noted, however, that the Infinity Blade series was very much alive, with "more games, more books, and maybe even other products" still in the works. I downloaded it because it was free. I still can't be bothered to play it. 3x more downloads?! So the game still gets bought well over a million times a week. Not bad. bought? they were free downloads. so revenue loss. I think Apple has payed developers to make those apps for free because those are some of the best iOS exclusive apps out there. This just shows the power of the freemium model, i guess it is the future. This is in no way a freemium game. but not from me. Mine's just sitting there on one of my screens with it's "loading" progress bar 100% empty. I click it, and nothing happens. A few minutes later, some error appears telling me to go check iTunes, but iTunes doesn't have anything to say on the topic. Check your Internet connection. This is a 1.2GB game, it requires wifi and a lot of time to install. And check your remaining space. Great graphics for sure. Unfortunately they forgot about the game play. This 'game' is little more than a technical graphic demo at best. I'm looking forward when iOS games have these graphics and game play. That aside, it is fantastic what graphics the iPhone can push out. ATTACKING THE POSTER BEFORE HE IS BROKEN RESULTS IN SCRATCH ATTACKS WHICH ARE MUCH LESS EFFECTIVE. With these kind of sales figures i really don't understand why Dungeons was shelved? Surely it wasn't a financial decision!? If they further developed Epic Citadel to be an RPG game, it would've been fantastic. I always dreamed of wandering around in that beautiful city.